Suddenly life is about rocks. I know it sounds strange, but it seems like I’m living in a docu-drama that’s using “rocks” as a metaphor for obstacles. Anyhow, my “rock-themed” existence started when I had some extra water in my yard, so I thought a little earth sculpturing might be in order – a relatively simple job. A very able-bodied and experienced fellow came out with lots of fun machines – miniaturized versions of steam shovels, back-hoes, earth compactors, and a few other things that I don’t even recognize (but that are quite impressive). Away he starts digging, which abruptly ends when he hits “ledge rock” which must be some kind of local term for “impossible to move, break, dig, go over, under, around or through.” So we go to plan B, which is also foiled by “ledge rock” then back to a modified plan A, and well, right now my yard looks like a moon-scape – holes (there we go again), craters, ditches, dirt piles – unrecognizable. I had to deliver something while all this was going on, and as I drove along the river that twists and turns as the road does, I started looking at the boulders and rocks that littered the river bed (some as big as a Buick, some even larger!). 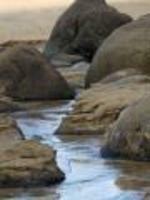 Looking closer, I saw that there were many boulders that were flat, worn down by the endlessly flowing water. I realize it sounds like a cliché, but I had a major epiphany about the concept of “go with the flow.” The literal rocks in my backyard and in the riverbed, as well as the metaphorical rocks in my life can’t be beaten into submission with force – only by going with the flow…slow, steady and continual can an immovable object be reduced to manageable sizes. April is winding down, but Prevent Blindness America wants to remind you that it's still Women’s Eye Health and Safety Month. 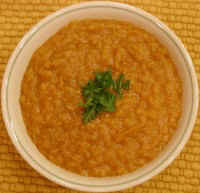 Today's outstanding soup, courtesy of vegetarian site AllCreatures.org, combines two powerful sources of beta-carotene (carrots and sweet potatoes) - essential sources of vitamin A for the ol' peepers. The eye uses vitamin A to essentially convert and transmit light signals to the brain. Deficiencies can result in night blindness, or more commonly, poor adaptation to vision in low light situations. Other beta-carotene rich foods are apricots, papaya, canteloupe, pumpkin, and mangoes. Certain dark green vegetables, such as spinach and kale, may also reduce your risk of getting age-related macular degeneration (AMD). Did anyone know this is ‘Turn Off Your TV Week’? Neither did I. But that’s probably because I was watching TV and missed it. Well, anyway this is the week that an organization called TV Watch, is advising Americans to hit the OFF button and spend more time enjoying our real life families rather than watching another rerun of a pretend family like, Everybody Loves Raymond (but I love that show!). I'm not sure how effective this segue is, but thought it might be a good time to revisit the idea of tuning out a lot of the noise in our lives (like the TV) and ‘tuning in’ by practicing some mindfulness techniques that are sure to help us get a little more joy out of everything we do. - Developing and practicingself-nurturing behaviors that support you in whatever challenges come your way. - And most importantly...having fun! This June Green Mountain at Fox Run will be holding their annual 3 Day Minduflness Retreat. There you can discover and practice techniques of visualization, mindful meditation, and yoga to help renew and bring peace and self-care to your daily life. Explore art, movement, and journaling as ways to celebrate and develop compassion towards your self. Use yoga, walking meditation and journaling as an opportunities to truly BE with you and find peace in stillness. Tags: mindfulness , journaling , meditation, retreat . I’ve always felt a bit guilty about consuming so much aspartame (my fake sugar of choice). I put it in my coffee, my iced tea and of course its in the diet soda I can't live without. (I also sprinkle a packet on my morning cereal). I’ve always felt in my heart or hearts, ‘this can’t be good’. Any chemical going in your body causes concern, especially, when you know that although it’s been sanctioned as ‘safe’ by some research, at one time or other, a year from now you’ll read that (oops!) over-consumption of fake sugar leads to male pattern baldness…or worse. But, today I breathed a slight sigh of relief when I read the following arcticle, reporting that the 5 approved ‘fake sugars’ currently approved for consumption in the United States are again being declared safe. Don’t get me wrong, I am in no way promoting them, I still suspect they can’t be good. Tags: sugar substitutes , nutrition , healthy eating , moderation . Healthy Information - Can You Get It From The Media? Remember when you could pick up the paper, get information and not have to question its validity? I think we all sense that the quality of most reporting has changed. In their effort to get viewers, readers and market share, the media seems more concerned with getting our attention, than getting at the truth. Especially, when it has to do with reporting on news about nutrition, obesity, weight loss and health in general. Scientific research studies don't make for snappy reading, so what we get instead are the all to frequent bi-lines and sound bites that are often misleading, at best. But who has the time to read all the research findings and their implications provided in a scientific study? I enjoyed this article on nutrition by Ed Blonz of The Contra Costa Times, where he talks about the recent findings in a low fat study and how this particular study reveals why so much media reporting is flawed. I've also listed some links below which also provide additional information regarding scientific studies and reporting to the public. Check it out. Dubbed a "delicious heart-healthy latino recipe" from the National Heart, Lung, and Blood Institute (NHLBI), this zesty gazpacho version uses less salt without sacrificing flavor. The NHLBI offers a free downloadable bilingual cookbook containing 23 tested recipes that cut down on fat, cholesterol, and sodium. If you enjoyed this recipe, come and enjoy our complete collection of healthy eating recipes. Tags: healthy recipes, healthy eating, recipes, recipes for living. Healthy Drinking...More of the Same Old Healthy Eating Advice? 'Have you seen the latest nutrition advice designed to help us manage our beverage consumption, and by default, our waistlines? Healthy Beveage Guidelines, published by the American Journal of Clinical Nutrition, have been designed by a panel of ‘leading nutrition experts.’ The work was funded by Unilever, makers of Lipton tea, and surprise, surprise, tea is heavily promoted as a beverage of choice – up to 8 servings of unsweetened tea daily. I’m not usually anti-food-industry; I do think some of the nutrition education that comes from their hallowed halls is valuable. That could be because I used to write a lot of it. But I’m taken aback by these guidelines because, once again, they have us counting calories, numbers of servings, trying to figure out percentages of what we eat, and in general, just eating (or in this case, drinking) by the numbers. No truly healthy eater I know eats or drinks this way. She may assess periodically how many servings of vegetables and the like she’s eaten – using a little wise nutrition knowledge to balance her choices – but basically, she listens to her body. As I write this post, though, I am finding a few things in favor of the graphic. I do occasionally run across the weight struggler who doesn’t realize that drinking a lot of juice every day may not be the best choice for her. Juice is fruit minus the fiber, and as a result, it has less staying power than the whole fruit. So you drink it and might find yourself getting hungrier faster than you would if you had the whole fruit. And you also might find you need more to feel satisfied initially – the whole fruit does a better job of filling you up. And of course, there is the all-too-common dieter who lives on diet soda. The guidelines advise no more than 4 servings of diet soda a day – that’s not 4 20-ounce bottles, btw. I think there’s two servings in one of those bottles. Up to 4 servings daily of coffee is okayed, and I guess that’s reassuring for those of us who like coffee but worry whether it’s really healthy for us. And the most recommended drink is water…but really, is there anyone left in the world who doesn’t realize that water is our best choice for hydration? Maybe I’m too close to the subject…. I spent some time over the weekend reading up on the 'fat gene'. Many of you may have been reading about it too and wondering, ‘Am I the one in ten? Do I have the dreaded gene? A new study which comes from research led by Alan Hebert, MBChB, PhD., of the genetics and genomics department at Boston University’s Medical School, delved much further and studied more people (approx. 4000 from different parts of Western Europe), than the previous Farmington Study and revealed that one in ten people carry a gene variant pattern that has a relationship with obesity. The INSIG2 gene is concerned with the metabolism of fat and can be linked to some obesity in people. It is definitely worth mentioning that the aspects of diet and exercise and how it affects obesity were not parts of this study. So, bottom line, the gene could be a variable in some obesity, but is very possibly not the only reason. I don’t know if finding out you have it is a good thing or a bad thing. On one hand you can say, ‘see, it’s not just me, I’m fat because I have the fat gene!’ But, the flipside of that coin is, weight management will always be that much tougher. Honestly, the whole concept gives me a bit of a headache. However, the general perception that all fat people simply lack will power, self control and the moral fiber to lose weight may now be given a much needed re-think. Those of us, who have struggled with weight off and on for years, know of course, that there is no simple solution to weight management. And to get hung up on whether you have it or you don’t may not serve much purpose other than to give one a little peace of mind - if you need it. If you want to know more about the gene, read here.